"In books I have traveled, not only to other worlds, but into my own." One of the things in life I am most grateful for are books. My love of reading is something that has been with me since I checked out my first chapter book--B is for Betsy--from the school library in first grade. As my friends know, I love talking about books, recommending books and hearing about other people's recommendations. So when I come across a book that knocks my socks off, I will write about it. 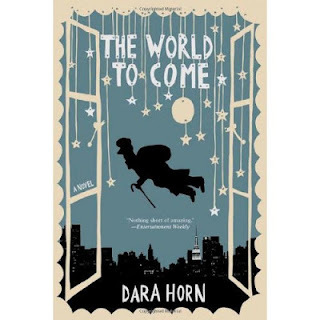 I discovered The World to Come by Dara Horn in January and wondered how I missed this gem of a book. It was published in 2006, and I feel cheated that it took me until 2012 to find it. It is one of the few books that I have willingly read twice in a six-week-period. The World to Come is part mystery, part historical fiction and part Jewish mysticism all rolled up into one delicious book with many layers to un-peel. It starts off in the present-day with Ben Ziskind, a former child prodigy, attending a singles mixer at a Jewish museum where he sees a Chagall painting that he is convinced belongs to his family. So he steals it. You are then whisked back to the 1920's in Russia and introduced to a cast of characters that includes Marc Chagall and the Yiddish novelist Der Nister, a.k.a "The Hidden One." Naturally, a connection is made between Ziskind's family and Chagall, and a suspenseful plot spanning 80 years is born. Yiddish folktales are woven throughout the book, and provide a strong thread between the past and the present. Horn is adept at handling the changing timelines as well as the changing character's perspectives. It would be easy to get confused with the multiple characters and settings that are introduced, but you don't. With each page I found myself getting drawn in deeper and deeper to the story. "It is a great injustice that those who die are often people we know, while those who are born are people we don't know at all. We name children after the dead in the dim hope that they will resemble them, pretending to blunt the loss of the person we knew while struggling to make the person we don't know into less of a stranger. It's compelling, this idea that the new person is so tightly bound to the old, but most of us are afraid to believe it. What if we are right? Not that the new person is the reincarnation of the old, but rather, more subtly, that they know each other, that the already-weres and the not-yets of our world, the mortals and the natals are bound together somewhere just past where we can see, in a knot of eternal life?" We read this in my book club, and while everyone really enjoyed the book, we held divergent opinions on the last chapter and it made for an interesting and lively discussion. I think The World to Come is a great choice for anyone interested in a well-told story that makes you pause a bit and think. A special plea: If you're going to buy The World to Come, I urge you to consider buying it at your local independent bookstore. How fascinating - thank you for this recommendation. I love to read, too, and am very selective, especially about fiction. I love stories that have a historical component, and to have it combined with art - it sounds like a wonderful tale! I think you both will like this. DO let me know what you think (and Mary, I'd love to hear how it goes in your book club). Enjoy!! Robin, I read the book at your recommendation last month. It definitely had its magic at times for me, especially the concept of 'the world to come.' she's a pretty amazing author. I think I might have appreciated it more being able to talk about it with others, so maybe I'll recommend for my book club sometime. thanks for sharing through your post! I loved this book. I'm glad you discovered it.